Since 1982, Bulldog Movers has been the Atlanta moving company that residents and businesses have turned to when they want moving professionals with the expertise to ensure a worry-free move. With an immense moving fleet with nearly 30 of our signature red trucks and a full-time staff of more than 100 highly trained movers, there is no move that is too large in size or scope for our full-service movers to successfully perform. Nearly 80 percent of our business comes from repeat customers and referrals, due to our dedication to providing moving services of unmatched skill and maintaining an unwavering commitment to total customer satisfaction. In fact, our company’s outstanding reputation for exceptional moving services has earned us the distinction of being the only Atlanta moving company to have earned the Consumers’ Choice Award each year for almost a decade straight. No matter what type of moving service you need, you will always receive an honest and upfront moving estimate that includes all the labor, trucks, fuel, blankets, floor and wall protectors, tape, dollies, and shrink wrap necessary for a cost-efficient move. You’ll never experience hidden costs on your bill when you choose Atlanta’s most trusted moving company, Bulldog Movers. 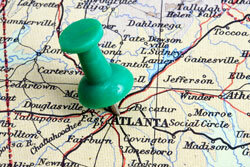 For more information on our Atlanta moving company, contact us today.